The Great Bear is located in a one of the most scenic areas of the Herens valley, approx. 10 min on foot from the road. The broad views (from the balcony, terrace and even from the beds!) look up to the tall 4000m peaks and down on the traditional villages in the valley. 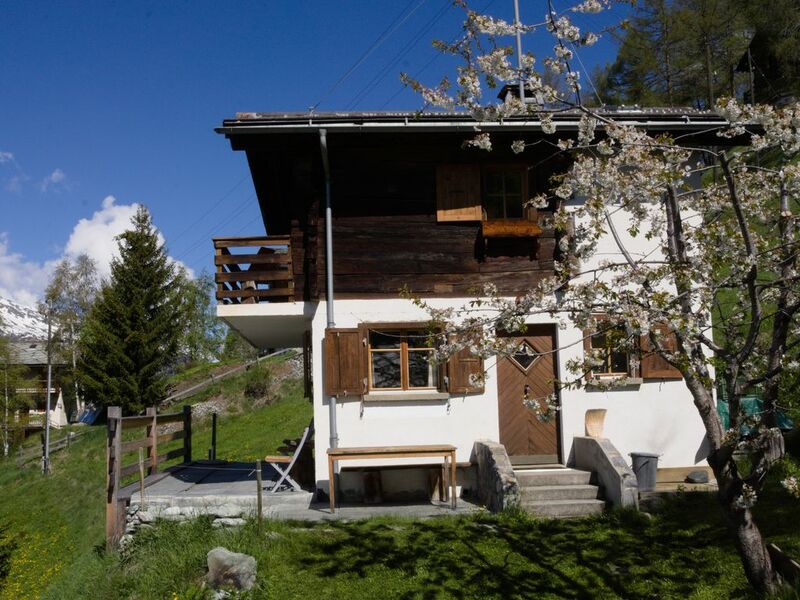 It is a typical chalet of the valley, built and equipped for families. We love its character and the charm of the surroundings and are often there on holidays ourselves! The Chalet is located slightly above the village of Villaz (La Sage), in the fields - ideal for those looking for space and a little isolation from roads (great for kids!). You reach the chalet on foot, approx. 5-10 min from the covered private parking place in the village (included in the rental price). We recommend appropriate bags for carrying your belongings. Please don't hesitate to visit our website www.chaletherens.ch for more booking options at attractive prices. Agnieszka and David love being in the nature and know the Alps very well. They often go to the family Chalet to wind down and go hiking or skiing. They rent out this family chalet to other people enthusiastic about the beauty and simplicity of the Val d'Herens. Although the weather was not perfect for skiing we could still enjoy the snow in a small but beautiful station in Arolla, breakfasts in the sun on the chalet's terrace, afternoons by the fire and eating a lot of cheese from the region. The chalet is great for 4 people and has everything you may need to have a comfortable stay. Definitely recommendable! Die Aussicht von der Terrasse bzw Balkon von den Schlafzimmern ist wunderschön! Die Lage in Villaz ist perfekt, um das Wallis zu erkunden und zudem schön ruhig und abgeschieden. Danke für Ihren Kommentar! Von der Hütte aus ist der Blick auf die Alpen und auf zwei über 4000 m Gipfel herrlich. So Dörfer und ihre typischen Häuser, mehrere Jahrhunderte alt. Es sind auch Gäste die am meistens Aussicht und Ruhe für Lesungen genießen! Sehr gemütliches sauberes Chalet mit einer tollen Aussicht auf die Alpen. Sehr schönes Wandergebiet in anspruchsvoller Lage. Grandiose Ausblicke! Danke für Ihren Kommentar! Unser Chalet ist gleichzeitig Komfort und Einfachheit, es ist auch direkt ein Ausganspunkt für Spaziergänge, eventuell verbunden mit einer Rückfahrt im Postauto. Wanderungen in den Dörfern erlauben auch schöne Entdeckungen … Wir freuen uns, dass es Ihnen gefallen hat. Es gefiel uns supper wir werden ganz sicher wieder kommen!!! La Grande Ourse est un chalet authentique, propre, bien amenage et avec tout le confort necessaire . Situe au coeur du val d'Herens avec un magnifique degagement sur les montagnes et de nombreuses balades facilement accessibles, nous ne pouvons que vivement recommande cet endroit. (Text automatically translated) FULL DESCRIPTION ON OUR SITE CUSTOM WWW.CHALETHERENS.CH! Come and join the Swiss town of Sion, in the Valais! Sion, take the road to Val d'Hérens (south), go to Vex, Evolène and Les Haudères. In Haudères, turn left before the bridge to La Sage (panel). Through the village of La Sage and join Villaz about 1km away. Leave the car in the village, such as the car park opposite the old grocery Gaudin. Villaz is also accessible by post bus from Sion. See www.cff.ch for drinks. The center of the village, about ten minutes walk will take you to the door of the cottage. (Text automatically translated) VISIT OUR SITE CUSTOM WWW.CHALETHERENS.CH! The area offers a multitude of activities depending on the season, such as hiking, walking, climbing, mountain, paragliding, mountain biking, downhill skiing, sealskin, ice climbing, skiing, snowshoeing. The fauna and flora are also abundant. When walking, it is not uncommon to see chamois, marmots, mountain goats, ptarmigan or eagles. Stay tuned!